It was finally warm enough for me to take my Sabbath Day walk today. It was breezy and still a bit chilly, but it has been a long winter and my soul has longed for the listening time that long walks provide. As I walked the trail along the road near my home I turned to my right and stopped to consider the wetland before me. 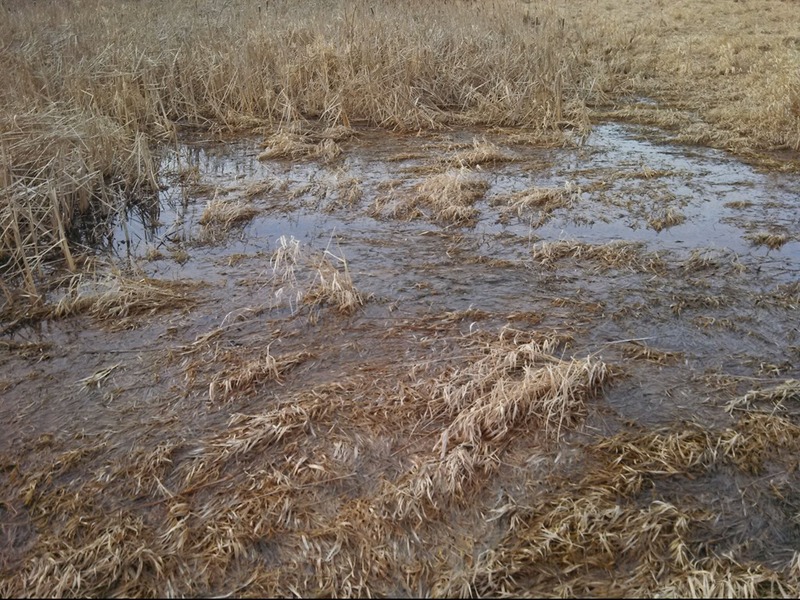 As the spring snows melt the wetland is swamped with cold water, water that is, as pictured here, in the process of completing the death of reeds and grass; water that will then help provide resurrection life to this wetland. As I walked the nature trail along the edge of the wetland, winding my way home while listening to a favorite author’s refection on the “suffering servant” prophecy of Isaiah 53; as I was listening to God speak through this word, it occurred to me that this wetland is a metaphor for the church’s spring: “Lent.” In Lent we listen intently to the Word which lays bare our souls. Just as the winter death and spring renewal are necessary, so are the death of repentance and the renewal of resurrection; in fact, I could not appreciate the resurrection without having experienced death, and not just the death of others, but my own death, the death I cause, the hurt I cause; perhaps especially that hurt I cause when I am convinced I am right. Oh, how our “righteous” anger is so often tainted! Oh, how easy it is to speak the truth, but fail in love! I consider a few events in the past, some from the recent past. Yes, I am among the transgressors for whom Isaiah’s “Suffering Servant” died. I am one of the many whose iniquities He—the Christ—bore. If this is true—and it is!—then how can I, who died to sin, still live in it? (Romans 6:2) How can I, who have been buried and raised with Him through Baptism, not walk in newness of life? (Romans 6:3-4) How can I, among the many who have been reconciled to God by Christ, not take up the service of reconciliation? (2 Corinthians 5:18) That is—to put it frankly—how dare I hold on to anger, keep a grudge, and make insipid the water of life! Yes, it is time; time to confess the anger and disappointment; time to forget what is behind and look forward to what is ahead; time to die to self and be alive in Christ, who has loved me and set me free.